GENESEO — The YMCA’s Summer Recreation program returns to Geneseo’s Highland Park with a record number of participating kids. This year’s Summer Rec has a record-high of 178 kids signed up to participate in their program. “This years numbers are the highest I have seen since I started as a counselor in 2004,” said Jeff Rose the Director of the Geneseo Summer Rec Program. Two years ago the program saw an increase from 40 to 110 kids. The program is still growing, increasing from last year average of 120 kids. Rose believes that it is important for kids to have an environment that is less structured then school but organized and a variety of activity for kids to choose from. Rose added that all kids are welcome and its never too late to sign up. The program gives kids the choices of sports and games, arts and crafts, and optional swim lessons. 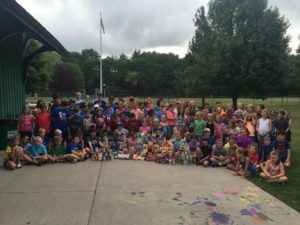 The program will be holding their third annual food drive to benefit the Geneseo Groveland Food Pantry while continuing their yearly field trips to Minnehans, Sky Zone, Byrne Dairy, and Seabreeze.